In 1989 I began working with water as a conceptual and aesthetic component of my work. I Dream of You as I Swim was the first of many pieces where water brought its mythic, ambient, dreamy, geographic, and beautiful qualities to my images, video, and light installations. Much more recently– with the 2011 Requiem for the Netmakers, I started exploring the role water plays in our national discourse of protecting the environment vs. jobs, economic growth, and fossil fuel production. Water is a bold force of nature that mankind cannot control no matter how much we try. In American Literature, in film and in landscape paintings, the ocean has alternatively been personified, demonized, or made the stage for heroic drama. When an industrial accident damages large bodies of water, the focus is often on health and disease. In the news, an oil-covered animal becomes the emblem of environmental fault lines. It’s only further down the list of topic points that we start talking about jobs and the economy. Environmental disasters impact residents, the working-class and small business owners who depend on the local river, lake or ocean for their livelihoods in fishing, aquatic farming and tourism. Regional job-loss ensues and micro economies are devastated, from the fishing net-makers, the shrimpers and boat repairmen to the waitress, lifeguard and motel housekeeper. In a landscape where the age-old conflict of Man v. Nature is fought again and again, characters play the every-man, the middle-class worker trying to make sense of it all. Earth Breathing through its Elements was installed in a traffic tunnel, with a series of video screens displaying the elements personiﬁed by a competitive swimmer as Water, an African drummer as Earth, aKundalini yogi as Fire, and an aria singer as Air. Composed by Eric Moe, the soundtrack contains sampled sounds of human breath and the body moving.In Urban Aquarium the movement of a martial artist is paired with its counterpart in nature on multiple video screens. A broad mix of collaborators included Ben Opie composing for Theremin; Dr. Cary Simons, chiropractor; and Karen Hyleman, 3rd degree black-belt from the Oom Yung Doe school of martial arts. Into a swimming pool sculpture, photographic projections captured the light reflected off swimmers’ bodies and the water surrounding them.The green tiles across the front read: I Dream of You as I Swim. Materials include wood, white tile and teal-blue grout – with dead flowers honoring an old romance. •Federal Water Pollution Control Act, as amended by the Clean Water Act of 1977. 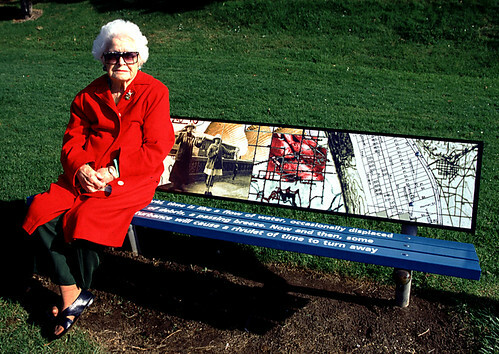 In The Invisible Clock park benches present a visual meditation on the nature of time, paired thematically with text from Alan Lightman’s Einstein’s Dreams.The text reads: In this world, time is like a flow of water, occasionally displaced by a bit of debris, a passing breeze. Now and then, some cosmic disturbance will cause a rivulet of time to turn away . 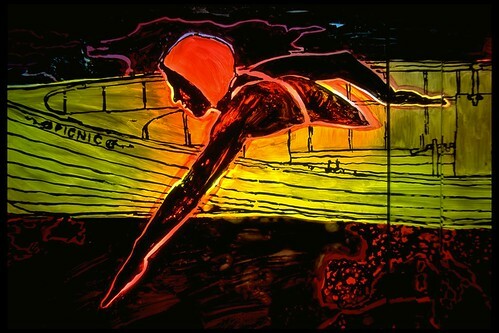 . .
Fluidity Electrique investigates the shared qualities of lissome, energizing motion in air and water– swimming, flying and the passage of light.Twelve lightboxes were installed across the front of the Pittsburgh Center for the Arts in Mellon Park. Illuminated black and white digital collages were printed on mylar, and then colorized with translucent paint and color gels. In Navigating the Critical Path, gallery storefronts were converted into lightboxes with transparencies, large-scale graphics painted on frosted mylar and fluorescent light fixtures. 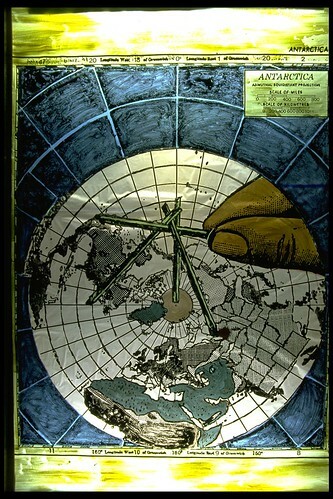 Made with neon, frosted mylar, and black ink, Lissomnesswas installed in a hallway glass cabinet.The graphics were originally made by collage using photocopies that were enlarged and transferred in ink to frosted mylar. The color you see is from neon tubing. 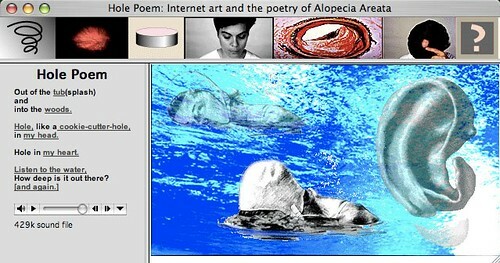 Hole Poem explores mind/body disorientation in a multi-layered, frames-coded web site, featuring two icons: the heart and head.The text and audio recording reads Listen to the water, how deep is it out there?